The Fendall Flash Flood Secondary Eyewash is Not ANSI approved to meet the standard as a primary eyewash station. 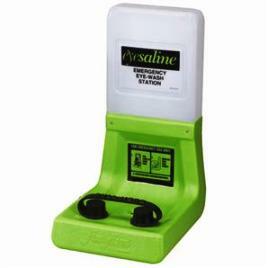 It's a secondary eyewash station to be used in the event of an eye injury until the injured person is brought to a primary eyewash station that meets the ANSI Z358.1-2009 standard or for professional care. The Fendall Flash Flood provide a 3 minute simultaneous flush to both eyes, is self contained for purity and does not require costly plumbing and installation. The Fendall Flash Flood Eyewash Station is easy to install and use. The cartridges are one gallon each and reserve cartridges can be purchased and stored on a wire rack for easy access. The cartridge has a shelf life of 24 months from the date of manufacture and 6 months once it is installed. If you are also looking for a primary eyewash, please look at the Fendall 1000 Eyewash on our site. The initial eyewash purchase includes one cartridge. Additional cartridges are available to keep as reserve in the event of deployment. Storage rack is also available to store cartridges close to the eyewash station. *Shelf life is determined by date of manufacture.